Maude White Bull stitching to Gunsmoke. The week I returned from Pine Ridge Reservation, still re-acclimating from a week away from mass media, I contemplated which big-screen movie would best ease my entry back into pop culture. The least jarring, I decided, would be Crooked Arrows. So on a Thursday afternoon, just five days removed from the South Dakota plains, I joined the crowd – if three can constitute a crowd – at a late-afternoon matinee of Crooked Arrows. To be fair, I have to admit that I found some obvious similarities between Pine Ridge and the film – most notably the message of self-empowerment that can come through rediscovering and recommitting to your true cultural and spiritual identity, while rejecting the racist stereotypes projected upon you by outsiders. One of the Crooked Arrows. 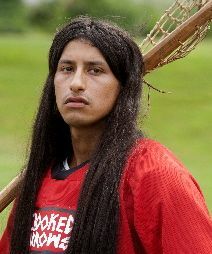 But for the most part, Crooked Arrows seemed about as far removed from my Pine Ridge experience as, say, Men In Black. When it came to setting, lush New York woods replaced Western plains, modest but decent homes replaced FEMA trailers, and roofs withstood wind without the aid of truck tires to keep them from bowing. The kids were well-fed. While alcoholism, suicide, diabetes, and unemployment are rampant at Pine Ridge, those things didn’t exist in this film’s universe. Those are just the differences in content – the most striking contrast came in the shape of story itself. Crooked Arrows, after all, is a typical clichéd youth sports movie: Crooked Arrows, like The Bad News Bears or The Mighty Ducks, features a rogue adult who is dragged into coaching a team of misfits. Despite many a comic debacle, coach and players somehow save each other. Demons are defeated and lessons are learned, and all this new wisdom and character is rewarded, as it usually is, both on and off the field. Hope grows, and that hope is well-founded. Which is, in a way, fine. Obviously, it would be as ludicrous to hold Crooked Arrows to the standards of sober-minded, socially relevant realism. These movies, geared toward the young, should offer laughter and hope. It would be nice if plot holes weren’t big enough to build a casino in – but what of it? Not every sports underdog story can be Hoosiers, and Hoosiers itself is no Hoop Dreams. Everyone needs some catharsis now and then. Assumption’s Justine and Kristen unload the lumber. Just the same, experiencing the reassurance of typical Hollywood story got me contemplating the more disquieting stories I experienced in Pine Ridge. What comes to mind is our last day of construction, for Maude White Bull up in Wanblee, about a two-hour drive from Re-Member’s base of operations. 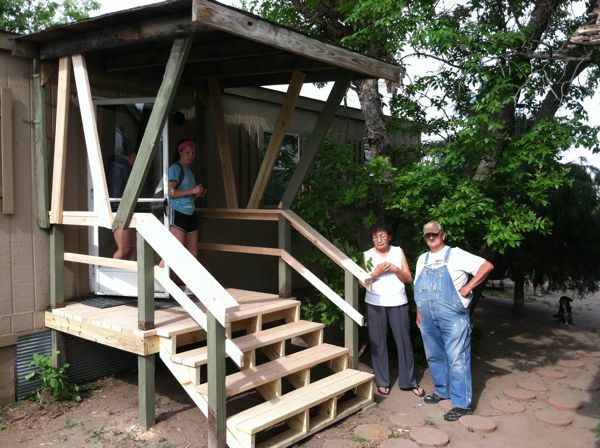 But our host had one thing about half the people on the rez lack – and that thing was indoor plumbing. Since the old steps disappeared after I entered, I had to wait patiently in the living room for the carpenters to create my exit. Which was fine. It gave me time to watch the construction of something as artistically dazzling as our porch was not – a Lakota star quilt, one of cheerful sky blue and rich yellow. Outline for dragonfly to come. 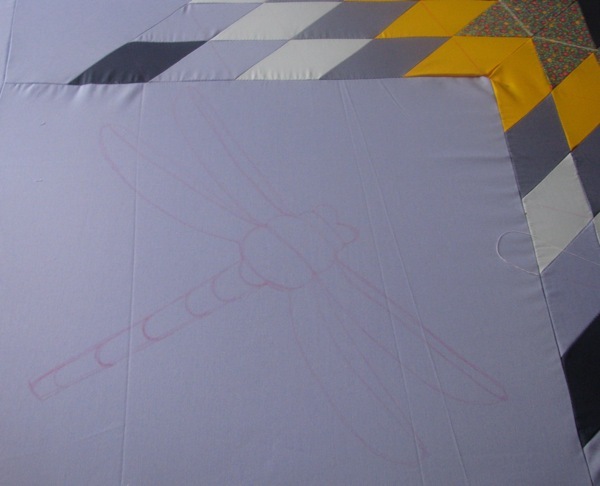 One of the blank spaces toward the corners bore a tracing to be filled by the end of the day – a dragonfly, a symbol of mature, lasting change. According to Jessica Palmer’s Animal Wisdom, the Lakota believed the dragonfly could dodge hailstones, which was why dragonfly images were on their shields. As she worked, I scanned the wall above her head, filled with family photos, including many of a young man in uniform. “Yes.” Then she volunteered the rest. That he served in Afghanistan, that he sustained wounds there, that he was in a military hospital with a spinal injury. “We’re making this quilt for him,” she said. The rest of the day we came and went, the colorful artistry taking form in the living room a sharp contrast to our own handiwork. During one idle moment, I tell our supervisor, Jerry, what I’d learned. But he, of course, knew more of her story – and the stories of so many others along the way. Once, he told me, his crew called to tell a woman they were building her porch that day; she told him to come on, but that she would be away, as she had something to do away from home. She arrived just as they were finishing, and burst into tears as she thanked the workers, telling them it was the kindest thing anyone had done for her. The thing she had to do that day? It’s never enough, of course. Not the porches. Not the steps. Not even, in all its hard-earned glory, the star quilt – itself a tradition the Lakota adopted only after the white man ended their access to buffalo hides, as well as the hunt itself. This is Pine Ridge, not Crooked Arrows. If I struggle with how to end this particular story – and I do – it’s because there are no tidy resolutions. But it would also be unrealistic to end in despair. For woven into this account are the stories of well-meaning college volunteers who began their week even worse at carpentry than the film’s young people were at lacrosse. The steps – like the roofs, the outhouses, the holes for the outhouses – are their own kind of triumph. Yet the stories of volunteers on the outside seemed almost Disney-esque compared to the narrative unfolding within: The story of the mother who couldn’t give her son the mythical power to dodge the projectiles of war – but could fuse her love for her son and her art into a quilt that would outlast our porches by decades. The story of the Lakota women who keep on keeping on – creating a place in a world of seemingly limited possibilities for both charity and artistry. Our host only took a break near the end of her day, when she came out to test her steps. Unlike the movies, there was no ceremony, no applause, no speech – she seemed like a woman who lets her needle do the talking. I didn’t even get to see the completion of the dragonfly. But I saw Maude White Bull descend our handiwork with a smile, seemingly finding her footing in this world a little surer. And I saw her climb back – back to the morning star, back to the dragonfly, back to weaving the story that never quite ends. Morningstar, symbol of new possibilities. Great Post! Sorry I didn’t respond to your email earlier – we have the month of June off in the office.